Welcome to the real world, Class of 2015. The days of living with a roommate might not be over. That's because a new grad would need at least one roommate to afford the median rent in any of the country's largest rental markets, according to a new report from Trulia. The report looked at the median income of new grads and the median rent in the 25 biggest housing markets in the U.S. To be considered "affordable," the total cost of a renting -- which included monthly payments and insurance -- had to be less than 31% of income. Personal finance experts often recommend budgeting around 30% of income on housing. St. Louis was named the most affordable, with 18.6% of rental units being affordable to new grads. The Gateway to the West has the lowest median rent in the country, at $868, and new grads in the city have a median income of $25,778, according to the report. 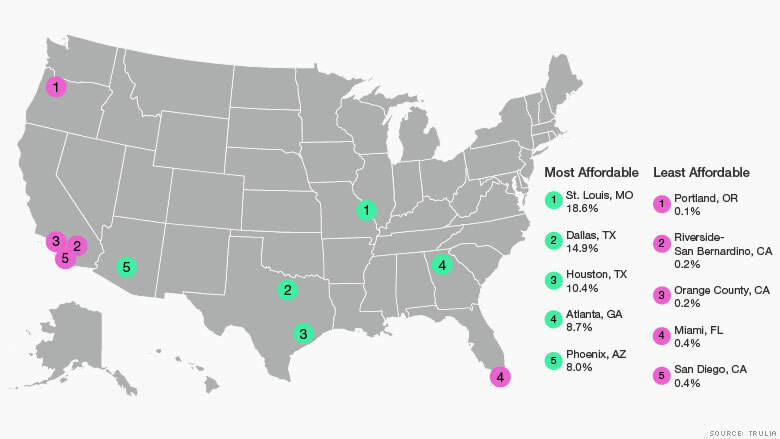 Portland, Ore., ranked as the least affordable. Median income for new grads in the city was the second lowest on the list at $18,560, and the median rent was $1,215. Graduates thinking of heading to the markets with good starting salaries should think twice, said Ralph McLaughlin, Trulia's housing economist. Renting tends to be the most expensive in areas that have the highest salaries. "It might be tempting for a new grad to move to a metro that has the highest income, but that doesn't mean they are going to have best quality of life," he said. For instance, graduates in San Francisco have the highest median income of $41,244, but the median rent is also highest at $3,500, according to Trulia.